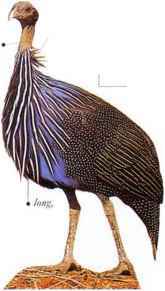 A solitary-living pheasant of tropic: rain forests, this species feeds on leaves, nuts, shoots, seeds, and invertebrates. Its courtship display is one of the most spectacular of all birds. After trampling clear a chosen area of the forest floor, the male begins to utter loud, ringing calls. I Ic raises his tail and spreads his wings to form a vast fan, glittering with the many "eye spots" on the vastly enlarged secondary flight leathers. 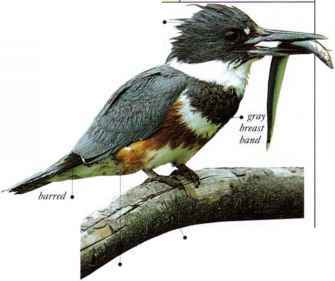 Most females thus courted will nest unaided after mating, while the male-displays to other females in turn. • NEST A hollow formed by body pressure on the rain forest floor, lined with leaves and situated under overhanging foliage. • DISTRIBUTION Malay Peninsula, Sumatra, and Borneo. I his bird can be recognized by its bare head and neck, resembling those of a vulture. The small ruff of feathers on the nape, and the tapering, blue feathers of the breast, are also identification features. It prefers the denser scrub and thickets of forest edge, which provide open space for it at ground level, while sheltering it from aerial predators. When alarmed, it prefers to run. although it can fly well and roosts in trees. When not breeding, birds move around in small parties that feed and roost together, maintaining contact by short, harsh calls. Larger groups are seen at waterholes. The birds breed in scattered pairs. The diet consists of seeds, shoots, leaves, tubers, bulbs, and fallen fruit, together with insects, snails, and other small invertebrates. Birds scratch the ground with their long, strong legs to find food items beneath the soil. • NEST a hollow made by the birds, thinly lined with plant stems, hidden in low vegetation. • DISTRIBUTION n.E. Africa in Somalia, Ethiopia, and Kenya. •REMARK This is the largest species of guincafow I.
I his rare bird lives in tropical rain forest, where it feeds on the ground, taking seeds, fruit, and small insects. 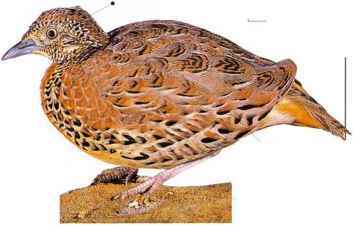 Superficially, it looks like a largish passerine with a small, rounded head and a pointed bill. The body ""'"/^'"f- hardly is rather heavy ' used forfhg/tt and ends in a surprisingly broad tail. The wings are short and rounded, and the bird is virtually flightless. On the other hand, this species has strong, agile legs, and it walks and runs easily on its lightly built feet. 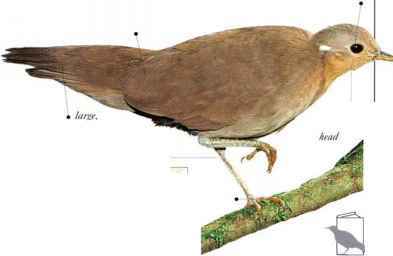 The Brown Mcsitc builds its nest in a tree, in a position that can be reached by walking up and down a sloping trunk or across branches. • NliST A thin, concave platform made of twigs, sparsely lined with grass or leaves, and placed in a tree.